392 pages | 125 B/W Illus. This comprehensive bookpresents a methodology for continuous process improvement in a structured, logical, and easily understandable framework based on industry accepted tools, techniques, and practices. It begins by explaining the conditions necessary for establishing a stable and capable process and the actions required to maintain process control, while setting the stage for sustainable efficiency improvements driven by waste elimination and process flow enhancement. This structured approach makes a clear connection between the need for a quality process to serve as the foundation for incremental efficiency improvements. 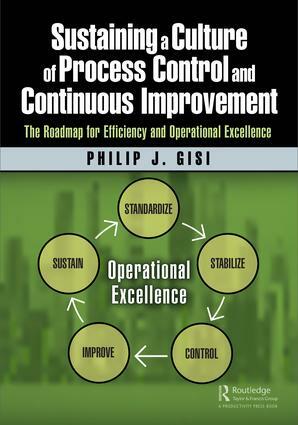 This book moves beyond talking about the value contribution of tools and techniques for process control and continuous improvement by focusing on the daily work routines necessary to maintain and sustain these activities as part of a lean process and management mindset. Part 1 discusses process quality improvement with an understanding of variation and its impact on process performance. It continues by stressing the importance of standardizing a process to achieve process stability. Once process stability is reflected in a consistent and predictable output, attention is turned to ensuring the process is capable of consistently meeting customer requirements. This series of activities sets the foundation for process control and the sustainable pursuit of efficiency improvements. Part 2 focuses on efficiency improvement by eliminating waste while improving process flow using proven tools and methods. Although there is a clear relationship between waste elimination and process flow, these activities are discussed separately to allow those more interested in waste elimination to work independently from those looking to optimize value stream flow. Part 3 explores the principles, practices, systems, and behaviors required to maintain process control while creating a mindset of continuous incremental improvement. It considers the role organizational structure, discipline, and accountability play as essential components for long term operational success. Provide readers with a clear roadmap for establishing, achieving, and maintaining process control as the foundation upon which to pursue efficiency improvements. Define the practices, systems, and behaviors required to realize desired results and develop a culture of process control and continuous improvement along the road to operational excellence. PART I QUALITY IMPROVEMENT: BUILDING A FOUNDATION FOR LEAN EFFICIENCY IMPROVEMENTS. 10 Creating a Culture of Operational Excellence (Culture, Principles, Systems, Behaviors and Results). 11 Daily Shop Floor Management: Through Structure, Discipline and Accountability. Philip Gisi, PMP, SSMBB, has over 25 years experience in the automotive, commercial and aerospace industries. His areas of expertise include new product development, process technology, quality management, automotive electronics and manufacturing efficiency improvements. He has worked internationally in multi-cultural environments and is currently involved in project management and efficiency improvements as an internal consultant at Continental Automotive. Phil has a Master’s of Science in Engineering, a Master’s Certificate in Project Management, Lean Management Certification from the University of Michigan, Project Management Professional certification and a Six Sigma Master Black Belt (SSMBB). Phil has been sharing his experiences in Project Management and both Lean and Six Sigma Process Improvement as a DePaul University instructor for over 15 years.